A little bit goes a long way — every bottle contains the potential for over 100 uses! It’s simple to use MB3. Just apply a pea-sized drop on your final application of toilet paper and discover what you’ve been missing your entire life. 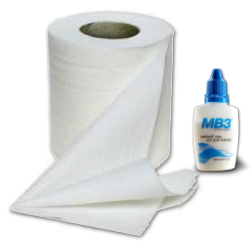 MB3 combines the smoothness of lotion and the cleansing power of soap to transform dry toilet paper into a true tool for hygiene. Unlike water, MB3 won’t dissolve toilet paper on contact. It glides easily on the skin without the toilet paper disintegrating during use. And unlike baby wipes, it’s discreet and won’t clog a septic system. MB3 is formulated to improve your personal hygiene without harsh or irritating chemicals. One dose of MB3 transforms toilet paper. Give it a try — and transform the feeling you get when you walk out of the bathroom! For the ultimate in comfort, we recommend you use a good 2-ply toilet paper, though, we can co-exist with a tough 1-ply! I am a folder. Wadding, to me, seems reckless and risky. But, I have friends and relatives who do it and I am sure there is an art to it. To me, folding is most effective. Carry out your regular wiping routine. Before the final wipe, prepare your toilet paper with MB3. As much as you may like to use a healthy squirt from the bottle, and as much as we’d like to have you buy more, you actually only need a small, pea size drop. It is possible to get over 100 applications from a 20mL bottle!